Our rural road is about 5km long and has many “wild” apple trees growing along the roadsides. Presumably over the decades, children waiting for the school bus have dropped their apple cores and some have resulted in apple trees. While it’s unclear who actually owns the resulting apples, they do seem to go to waste much of the time. This year, we thought we’d put some to good use. 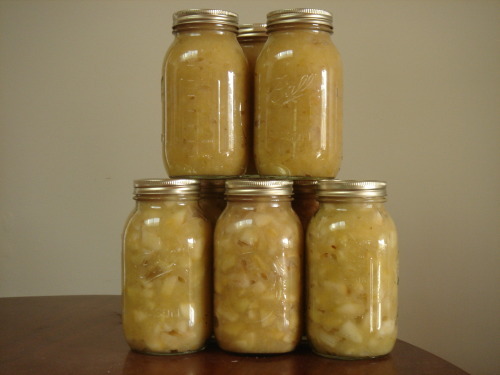 An hour of collecting gave us these jars of apple preserve (for pies, desserts, applesauce etc) and a few Kgs of frozen apple slices. It’s tempting to sow a few more “random” fruit trees on the roadsides to see what else we could harvest in years to come. Lots of pears just about ready to go so we’ll have some of those soon. It’s fun being a hippie….